Marijuana Financing for Legal Cannabis Businesses - Apply Today! As of mid 2017, medical marijuana is legal in 29 states and 7 states have legalized recreational use. 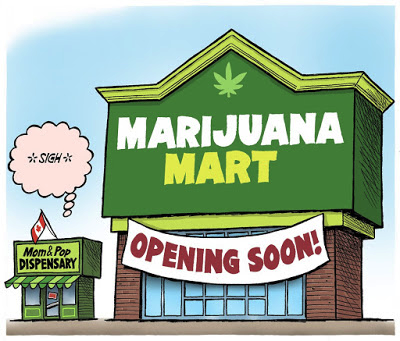 This has resulted in a “pot rush”, where many enterprising individuals are entering the market to somehow capitalize on marijuana. Successful existing cannabis businesses are growing tremendously, the weak ones are getting shaken out, and new players are stepping on the scene. All of this has resulted in a tremendous need for marijuana financing, namely working capital. 4 month revenue history – just getting started? No problem. This type of funding requires no collateral and is often unsecured. The way it works is that the funding institution will “purchase” a chunk of future revenues from the business, in exchange for a fixed payback. Payment amount is determined by past bank deposit activity, and is often represented as a percentage of historical average deposits. Basically, payback is a fixed royalty (i.e. 10% of revenue) for a fixed period of time (until paid off). The future revenue purchase is ideal for cannabis businesses for a few reasons. First, the time to receive funds is usually 48 hours. Second is that it is way cheaper than investors. A relatively new cannabis business might pay a lender 20-30% over 6-18 months, but that same business would pay an investor 20-30% for life for the same amount of money. Also bear in mind that this is more expensive than a traditional product like a loan because it is often unsecured, no collateral is required, nor is a personal guarantee. Lastly, there are no limitations for which the funds can be used. Expansion financing – we’ve had many clients use the funds to make a down payment on a new leasehold for expansion of their growth operations. Many cannabis businesses are on the hunt for new, bigger locations and are being outbid by their competitors. Having the capital in hand to back up your bid goes a long way. Funds can also be used to purchase heat lamps. Acquisition financing – now that the market is becoming (relatively) more mature in states like Colorado and Washington, smaller players are realizing the struggle and offering their businesses up for sale. This is allowing the bigger players to capture more market share at scale. The revenue advance can be used to acquire existing businesses or assets from a business. Working capital – sometimes businesses simply need the extra cushion in their bank account to bridge them to busy season. Or to hire new staff. Whatever the reason may be, this is a great marijuana financing solution provided however you have the margins to support the payback. Emergency capital – as a business owner you know things can go wrong and fast. Having access to liquidity can help you prevent disaster by affording you the ability to remedy the situation as needed, and in a timely manner. A typical revenue purchase for a cannabis business that averages $100,000 in deposits would look like this: the funder would purchase $125,000 of future revenues in exchange for $100,000 up front. Viewed differently, the amount the cannabis business would receive is $100,000 and the payback would be $125,000. Payments are usually 10% of average monthly deposits, or $10,000 in this case. So the payback time would be slightly over a year ($125,000 divided by $10,000 = 12.5 months). Contact us today if you’d like to learn more!